American Club Pipe Tobacco is a unique brand that combines cask aged Virginia and Kentucky burleys to create a classic American blend tobacco. Offered here at our online tobacco store, American Club Pipe Tobacco is value-priced perfectly for those smokers who like to use this premium tobacco smoked straight from their favorite smoking pipe. American Club Pipe Tobacco gives little to no bite, with a very light and mellow flavor producing a nice aroma with a smooth finish. Whatever your smoking preference is, American Club Pipe Tobacco is a high quality tobacco that’s made just right for any smoking occasion. American Club Pipe Tobacco is distributed nationwide by Lake Erie Tobacco Company, Cattaraugus, NY USA. 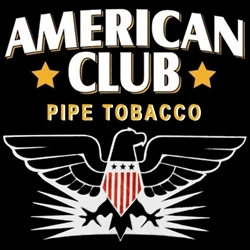 American Club is available at our online tobacco store in unique styles to choose from. Currently available in Menthol flavor. American Club Pipe Tobacco offers is a great alternative to expensive and over-priced retail brands. Here at Smokers Discounts we’ve made it easy and affordable to buy pipe tobacco online. Call us for more details!